Relegation-threatened Ifield’s next game is another crucial one as they host Middleton, who are just one place above them in the league. Captain Jack Groves stressed how important this Saturday’s game will be between second-to-bottom Ifield and the eighth-placed side. Groves hailed the match-winning talents of Cuckfield’s Brad Gayler whose impressive 126 made the difference between the two sides. He helped his side set a huge target of 273-9 declared which Ifield fell short of, scoring 143 in their reply in a 130-run defeat. Groves said: “Brad batted really well. He knows what his strengths are and stuck to them. Ifield came away from Cuckfield with nine points, a marginally improved performance but ultimately another loss. Cuckfield won the toss and stand-in captain Gayler decided to bat but it was Ifield who started the better when opener Gregory Wisdom was caught by Andy McGorian. Gaylor and Oates set about rebuilding the innings and were able to take the score to 106 before Oates fell for a patient 25. Ifield were able to apply some good pressure in the middle overs and picked up further wickets. Gayler stood firm and eventually reached a well-deserved century before opening up and quickly going on to an excellent 126 before he was finally dismissed by a catch on the boundary off the bowling of Harnoop Kalsi. At 215 for 7 Ifield felt they were still in the game but late runs from Nick Patterson (41) and Jamie Hutchings (17) frustrated them and Cuckfield finally declared on 273 for 9 after 57 overs. There were four wickets for Kalsi and three for Pearce. Jack Groves said: “It’s another frustrating week on the batting front. The Ifield reply got off to a poor start when Mahad Ahmed (0), Nathan Amin (9), Paul Clifford (14) and Sam Dorrington (4) were all dismissed and at 33 for 4 the batting was again looking fragile. But Mike Norris and Dan Smith dug in and took the score to 75 before Norris was caught behind for 29 and then with no further addition to the score Smith was out in the same way for 17. Skipper Jack Groves, badly in need of runs, and brother Dan were betwixt and between and while Jack adopted the more patient approach. Dan hit two quick boundaries before being caught in the slips for 10. At 85 for 7 Ifield found themselves batting for pride and maybe an extra bonus point. 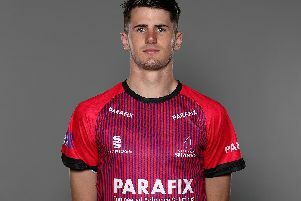 Groves ended up top-scoring with 33 and was at least able to guide his side to an extra bonus point but once he departed with the score on 138, the game was up and Patterson with his fifth wicket secured the victory as Ifield were all out for 143.